Spec Ops: The Line is one title I have been eagerly awaiting, and now that it’s available on Linux I took a look for you. The Linux port is from Virtual Programming, who gave us The Witcher 2, Stronghold 3 Gold and Bioshock Infinite. Their porting tech has come a long way, so it’s time to check out another game ported with their proprietary eON technology. Specs: Nvidia 970, Intel i5 4670K, 16GB RAM. It did start with lowest everything, and a resolution of 640x480, but it was painless to crank up up. The settings change was instant too, so no reloading needed. So far performance seems to be mostly good, I've seen it bounce between 60FPS to well over 140FPS. This is with the highest possible settings that I'm able to set. That's pretty on-par with most other big releases that we have had, so they did a pretty good job as far as framerate goes. During the first battle on foot the performance seemed great, and I was still getting well over 100FPS, but I have noticed some micro stuttering here and there, and it seems like it’s when it’s loading an area much like Bioshock Infinite does. One of them lasted for 2 seconds, and that’s the most I’ve seen. It is a little bit distracting when it does it. It also stutters when something big happens, like an explosion. It seems to be much more stable than Bioshock for reference, Bioshock I could crash quite easily, but Spec Ops: The Line has been open the whole time, with a lot of alt+tabbing, and it worked fine while recording a video and rendering the video in the background. That's pretty great news for me! 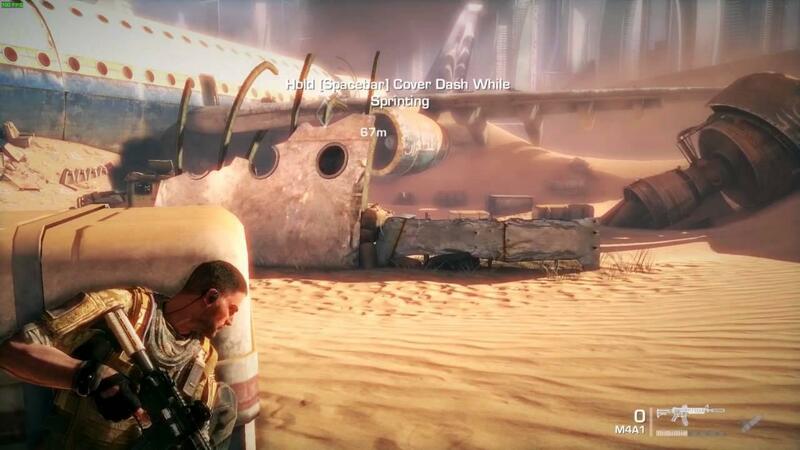 It seems like a pretty standard story-based third person shooter, with some reasonably pretty visuals. I say reasonably as it's quite bright, seems like it has a lot of bloom going on. The intro scene seems pretty on-par with what you find in most Call of Duty games, and that makes me a happy gamer. Nothing like a good Hollywood style showdown. I don't care how others feel about such scenes, I think they're good old fashioned fun. I like helicopters, I like big machine guns, and I flipping love blowing stuff up. There’s plenty of banter between characters, and it has already given me a few chuckles as you comment about the stupid remarks one of your soldiers makes. This seems like a repeating thing too, goodie. I like games that have chatty characters, as it enables me to get a little more engrossed in the story and the characters themselves. The stuttering I mentioned before is a repeating issue though, and it doesn't make the game a perfect experience for me. I have the same issue as with Bioshock, my Logitech F310’s look is inverted even though it’s turned off, setting it to “on” in Bioshock fixed it, but I am unable to change that setting in Spec Ops: The Line, it’s quite annoying. If I try, it flickers extremely fast to on and off again. Final Verdict: Honestly, it seems like a reasonable port and an interesting game, but the stuttering is really quite annoying. If they fixed the stuttering, then it would be gold. 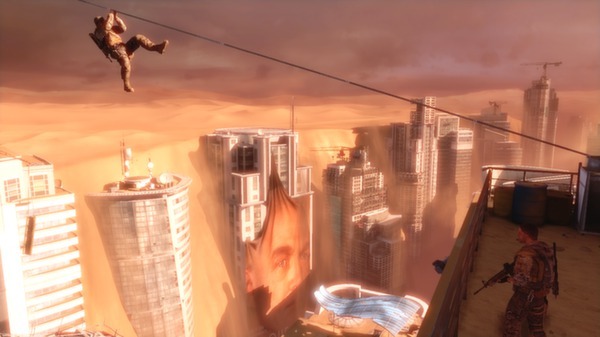 You can find Spec Ops: The Line on Steam and Humble Store, it’s also dirt cheap right now. Thanks for the report Liam! As for VP ports, how is the updates on Witcher II? Are they still in Beta or they have released it for the "stable" version? filsd Thanks for the report Liam! Post updated, now with video goodness. Works quite well with controller as well! Thank You! It's £3.99.... I don't want to buy it, I'll probably never play it, but...it's £3.99. Instantly bought it as I've seen this discount. Bought it to see what the hype is all about. Installed, ran...and it it's been running perfectly fine (not tried the controller yet). Everything cranked up to max, I get an average of about 30fps during action, though I see it pop up to 45 or 50 regularly. This is with an ondemand cpufreq setting, and r600g drivers. Yep, it's running flawless with Mesa 10.5.4. So that's cool. Pretty sure I could squeeze some more out of the game if I wanted, but there's currently no need. Nice to see VP settling into the groove of things - we're getting some decent games out of it. I'll try the kaveri at some point later. I downloaded it, but there seems to be a problem with the Xbox One controller. I tried two of my Xbox One controllers and for some reason it keeps detecting input from the controller and scrolling through the menus, and the camera keeps turning. It only happens with this game, and I haven't tried my 360 controller, don't know where I put it. I can use a keyboard and mouse, but that defeats the purpose of my Steambox being a replacement for a console, if I want to use a keyboard and mouse I'll use my desktop. I'll report to the devs, but I also wanted to share what I'm experiencing.